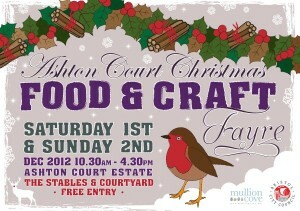 The Ashton Court Christmas Food and Craft Fayre is back with a bang this year with lots of festive activities and Christmas shopping for all the family on Saturday 1 and Sunday 2 December. With free entry and ample parking close by in the mansion car park, it’s the perfect way to shop for unusual and unique gifts from the selection of local craft and food producer stalls, all within the stunning surrounds of this 15th century estate. Expect to find a host of local crafts including stunning jewellery, handmade natural soaps, unique artist prints, felted garments, skillfully crafted wood products, festive hand crafted decorations and much more. Who can resist our food courtyard with stalls laden with Christmas gift ideas including locally made wine, cider and ale; artisan cheese, homemade jams and chutneys, olive oils and vinegars, handmade fudge, mince pies and clotted cream and delicious chocolates? Plus they have all the Christmas essentials including wreaths, flowers and Christmas trees. Whilst the adults can indulge in a cup of hot cider or mulled wine, there will be lots of activities to keep the children entertained including face painting, craft demonstrations and the opportunity to venture into the deer park to see Rudolf’s cousins by joining a guided walk with the estate deer keepers (booking essential). To get you in the festive spirit, they’ll be roasting hot chestnuts and serving up a delicious hog roast whilst keeping you entertained with Christmas carols. To keep up to date with all the fayre’s exhibitors and activities, visit their Facebook page by clicking here. The Ashton Court Christmas Food and Craft Fayre takes place on Saturday 1 and Sunday 2 December 2012 from 10.30am – 4.30pm, and will be located in the Ashton Court stables and hayloft. For further information, please call 0117 963 9174.